Our clients can avail from us a qualitative range of Portable Hot Mix Plant Equipment. These are offered in varied specifications and fabricated using quality raw materials and advanced technology. Our range is also offered in customized specifications as per the requirements of the clients and at competitive market prices. We bring forth our esteemed clients a qualitative range of Portable Hot Mix Plants. Our personnel make use of quality raw materials and precision engineering techniques. These are also in compliance with the prevailing industry standards and offered in varied specifications. We also customize these plants as per the details provided by our clients and offer our range at competitive prices. 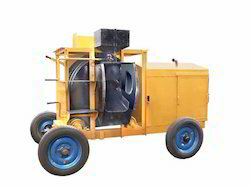 Looking for Portable Hot Mix Plant ?